The first episode of Marvel's What If animated series on Disney+ is going to put the focus on Peggy Carter. Disney has Star Wars Celebration going on and still decided to dump a huge amount of information on investors today, including the long awaited release date and price for the streaming service. Disney+ launches on November 12th, and it's going to cost subscribers $6.99 a month or $69.99 for the entire year. While that's all well and good, Marvel fans have a lot to look forward to now. 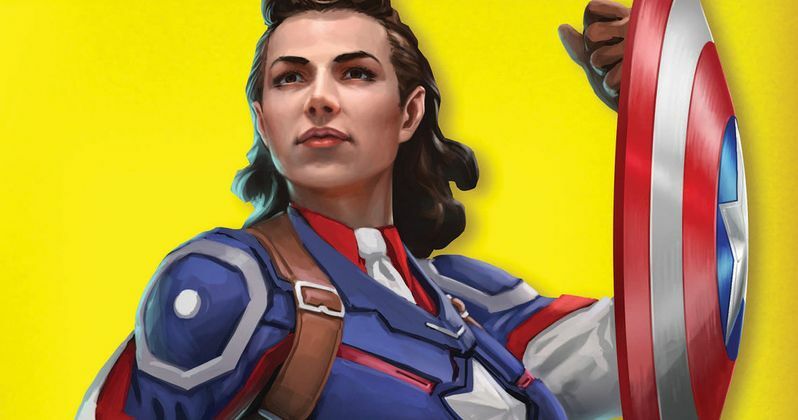 Marvel Studio boss Kevin Feige has announced that the first episode of the animated What If series will tackle what if Peggy Carter received the super-soldier serum and turned into Captain America. The What If comics were a Marvel staple back in the 1970s and always brought characters or situations together, which would likely never happen in an ordinary comic storyline. Loki taking Thor's hammer? No problem. How about Spider-Man joining the Fantastic Four? That happened too. The What If series is going to allow Marvel to get pretty crazy with the animated series, which will bring a whole new dimension to the Marvel Cinematic Universe. With that being said, the MCU is far from being neglected by Disney+. In addition to the official confirmation of the What If series, it has also been confirmed the Falcon & Winter Soldier series is officially happening and it has been reported a Hawkeye series starring Jeremy Renner is up next with his Clint Barton character passing the torch to Kate Bishop. The Marvel Cinematic Universe is about to change forever with Avengers: Endgame. It's the official end of the MCU's Phase 3 and will usher in the beginning of Phase 4, which officially starts with Spider-Man: Far From Home this summer. With the addition of Disney+, we're going to be treated to long story arcs, which will be closer to the comics and Kevin Feige is really excited to get these new stories told in a way that isn't possible on the big screen. Plus, it's believed all of these new shows will have a significant budget behind them to keep everything uniform with the MCU. Disney+ is shaping up to be a monster. It isn't clear when the What If animated series will debut, but he Falcon & Winter Soldier series is expected to drop within the streaming platform's first year. While many were expecting Disney to take it easy and grow, they are going straight for Netflix and Amazon with an assortment of original content and iconic vault material from the history of the studio. It's really pretty crazy to think about and it's going to be very interesting to see how everything works out when Disney+ debuts later this year. The Hollywood Reporter was the first to announce the What If first episode storyline details.